Spain had been the first land power in Europe up to the peace of the Pyrenees in 1659. By 1700 the Spanish army had however been annihilated by financial mismanagement, especially the inability of the crown to pay a regular sold to its soldiers. To a certain extent the 'Spanish army' did not exist. There was a Spanish army in Spain, one in the Spanish Netherlands, and one in Italy, all with their own paymasters. Some say that in Spain itself the Spanish army numbered only about 17,000 men in 1700. On 24 December 1702 it was stated to count 17 infantry regiments and 7 cavalry regiments. That same day a decree was issued to bring all infantry regiments to a strength of 1,000 men, the cavalry regiments to 500 men and to raise 1 cavalry and 4 dragoon regiments, but one can doubt the execution of this decree20. 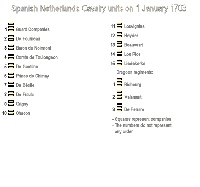 The regiments of the army in the Spanish Netherlands are described on separate pages. cf Spanish Netherlands Cavalry and Spanish Netherlands Infantry. In the Spanish Netherlands the strength had gone from 70,000 in 1658 via 15,000 in 1690 to perhaps not more than 6,500 in 1695 1. By 1701 the army of the Spanish Netherlands numbered 18 'miserable' infantry regiments and 14 cavalry and dragoon regiments to a total of 6,000 'gueux et voleurs' (beggars and thiefs). The task to rebuild the army in the Spanish Netherlands was entrusted to Puysegur. His job was to rebuild this army to 49 infantry battalions of 650 men and 46 cavalry and dragoon squadrons of 140 men each. These were to be supported by 6 Spanish and 3 Italian infantry regiments. This plan thus called for an army of about 44,000 men. This was not unreasonable for this part of the Spanish Empire, but the bad reputation for payment and the short time in which the soldiers had to be recruted forced the government to press young men into service, which had a negative effect on the quality and loyalty of these troops. On 20 July 1702 there were 25 batallions and 27 squadrons in service2. Somewhat later an overview of the cavalry was made which showed 31 cavalry squadrons and 9 dragoon squadrons3. By January 1702 another 20 battalions were forming and the cavalry strength was listed as 40 squadrons4 . Tercio Lombardy / LOMBARDIA since 1633, in 1701 under command of the Conde de Aguilar45 (app. 7 April 1694), succeeded by Prince Francisco Pio de Saboya in 1702. The Lombardy became a regiment in September 1704. Went to Spain in 1707. It was renamed to Principe in 1776. Sicily, the Sicily regiment was raised in Naples in 1704 under colonel Don Pedro Vicco. He was succeeded by Luis Mayoni. In 1733 it was merged into the Parma (SAMANIEGO). MILAN regiment. Acc. to SAMANIEGO the Milan was first raised in Naples in 1704 under Coronel the Duke of Castel de Ayrola, succeeded by Francisco de Eboli, Goffredo de Caetano and Count Borromeo. BASILICATA / CORCEGA. According to SAMANIEGO this unit was formed in Naples in June 1658 by J.M. Caracholo marquis de Torrecuso, succeeded by Marcio Grilla, P.A. Auria, R. Candelmo Duke of Popoli, Don Carlos Campos, Don Pablo Mano, the Duke of Matamena, Don Bernardo Garaffa, and as ninth Don N. de Gioveni, who commanded in 1724. In the memoirs of Berwick we there is a statement for 1707 saying that the Louvigny regiment that was placed in Benavari and Ribagorza was taken and that it was a pity because it was well composed in officers and soldiers, all Germans21a3. In Maintenon's correspondence these are said to have counted 650 men. The two most important sources for the Spanish Army of the time are SAMANIEGO and CLONARD. SAMANIEGO wrote the Disertacion sobre la Antiguedad de los Regimientos de Infanteria, Cavalleria y Dragones de Espana in 1738. CLONARD wrote the very large work: Historia Organica de las armas de Infanteria y Caballeria. PELET brought together an enormous amount of Orders of Battle and other data about the War of the Spanish Succession. 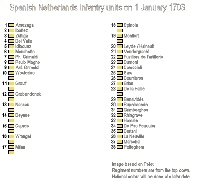 In these data many names of regiments of the Spanish Netherlands are mentioned, giving the opportunity to cross-check data. 20) The Hollandsche Mercurius for 1703 page 139 mentions a decree issued in Montferrat on 24 December 1702. 33) Letter by Electress Sophie to Leibniz on 19 November 1701, also mentioned by Pelet Tome 1 page 597 as 'De Mauroy'espanols 6 escadrons. 37) Nouvelle collection de Mémoirs pour servir à l'histoire de France, has Berwick memoirs with the statement about Louvigny.